A total of 23 emm types were identified in 1,218 S. pyogenes isolates. The five most prevalent emm types were emm 12 (50.4%), emm 4 (23.2%), emm 1 (16.4%), emm 6 (3.8%) and emm 22 (3.0%). PFGE analysis with Sma I suggested that, with a few exceptions, strains with a common emm type belonged to the same clone. There were two large emm 12 clones, one with DNA resistant to cleavage by Sma I. Each prevalent emm clone had major PFGE strain(s) and many minor strains. Most of the minor strains emerged in the population and disappeared soon after. Even some major strains remained prevalent for only 2–3 years before declining. The large fluctuation of scarlet fever cases between 2000 and 2006 was associated with the shuffling of six prevalent emm clones. In 2003, the dramatic drop in scarlet fever cases in central Taiwan and throughout the whole country was associated with the occurrence of a severe acute respiratory syndrome (SARS) outbreak that occurred between late-February and mid-June in Taiwan. Streptococcus pyogenes (Group A streptococcus) is a common pathogen responsible for a number of human suppurative infections, including pharyngitis, impetigo, pyoderma, erysipelas, cellulitis, necrotizing fasciitis, toxic streptococcal syndrome, scarlet fever, septicemia, pneumonia and meningitis. It also causes non-suppurative sequelae, including acute rheumatic fever, acute glomerulonephritis and acute arthritis . Scarlet fever, characterized by a sore throat, skin rash and strawberry tongue, is most prevalent in school children aged four to seven years old. This disease was listed as a notifiable disease in Taiwan until 2007; as such, all cases of scarlet fever had to be reported to the public heath department. According to our records, however, only 9% of the medical centers, regional hospitals and district hospitals in central Taiwan reported cases of scarlet fever to the health authorities between 1996 and 1999. The number of scarlet fever cases is therefore likely to be significantly underreported. Scarlet fever outbreaks frequently occur in young children at day-care centers, kindergartens and elementary schools [2, 3] and also occur in adults upon exposure to contaminated food . Genotyping bacterial isolates with various methods is frequently used to compare the genetic relatedness of bacterial strains and provides useful information for epidemiological studies. In a previous study, we used emm (gene of M protein) sequencing , vir typing  and pulsed-field gel electrophoresis (PFGE) typing to analyze a collection of streptococcal isolates from scarlet fever patients and used these data to build a DNA fingerprint and emm sequence database for long-term disease surveillance . Vir typing has since been abandoned in our lab because it has lower discriminatory power than PFGE and the protocol is difficult to standardize with conventional agarose gel electrophoresis. In contrast, the PFGE protocol for S. pyogenes has been standardized in our laboratory, and a second enzyme, SgrA I, has been found to replace Sma I for analysis of strains with DNA resistant to Sma I digestion . Since PFGE is highly discriminative and emm sequencing provides unambiguous sequence information regarding emm type, we adopted these two genotyping methods to characterize streptococcal isolates and build a Streptococcus pyogenes DNA fingerprint and sequence database for the long-term study of scarlet fever and other streptococcal diseases. The number of scarlet fever cases in central Taiwan fluctuated greatly between 2000 and 2006. Relative to the number of scarlet fever occurrences in 2000, occurrences increased in 2001 and doubled in 2002, but dramatically dropped in 2003. The number of occurrences increased again since 2004. In this study, we characterized 1,218 isolates collected between 2000–2006 by emm sequencing and PFGE. The bacterial genotyping data and the epidemiological data collected via the Notifiable Disease Reporting System (established by Taiwan Centers for Disease Control (Taiwan CDC)) were used to examine the significant fluctuation in the number of scarlet fever cases between 2000 and 2006. Taiwan is an island country populated by 22.9 million people, most of whom reside in the western region (Figure 1A). The population in northern, central, southern, and eastern areas is 10.2, 5.7, 6.4 and 0.6 million, respectively. Nationwide information for all notifiable diseases has been systematically collected since 2000. For accurate analysis, the number of confirmed scarlet fever cases was adjusted by multiplying the number of reported cases and the specimen positive rate. The total, adjusted number of confirmed cases throughout the whole country increased from 716 cases in 2000 to 1,258 in 2002, but dramatically dropped to 771 in 2003 (Table 1). This number increased again in 2004 and, in 2005, reached the high levels seen in 2002. However, the number of cases slightly declined again in 2006. In central Taiwan, the epidemiological trend was similar to the national profile, but fluctuated more dramatically between 2000 and 2004. While the number of scarlet fever cases was 142 in 2000, this number doubled in 2002 but then dropped in 2003 to the levels seen in 2000 (Table 1). The number of cases increased again in 2004 and, in 2006, reached the levels seen in 2002. The number of cases in 2006 was greater than that in 2005 and differed from the national trend. The number of cases in central Taiwan accounted for 18% to 24% of cases throughout the whole country. (A) Map of Taiwan and population density (B) National weekly reported cases of scarlet fever between 2000 and 2006. The total average throughout 2000–2006 is indicated by a red dashed line. The two stages of the SARS epidemic in 2003 are marked by blue (stage I) and red (stage II) bars. Reported and adjusted confirmed scarlet fever cases in the whole country and in central Taiwan from 2000 to 2006. The profiles of weekly reported cases revealed that scarlet fever was more prevalent in the winter and spring seasons (2nd – 25th weeks) in 2000–2006. However, there was a remarkable decrease in the number of cases in the 6th and 7th weeks (Figure 1B). This decrease may be due to the long holiday of the traditional lunar New Year and winter break from school, as it is usually from late-January to mid-February (4th – 7th weeks). The weekly reported number of scarlet fever cases in 2002 was mostly higher than the weekly average from 2000 to 2006 (Figure 1B). In 2003, except in the 11th week, the number of weekly reported cases in the first 16 weeks was greater than the average. Furthermore, the number of cases between the 4th and 9th weeks was even higher than that in 2002. After the 16th week, the number of cases in 2003 was below the overall average and was significantly decreased from the 17th to 24th week (mid-April to mid-June). A lower level of reported cases lasted until the first half of year 2004. In early 2003, a severe acute respiratory syndrome (SARS) outbreak occurred in Taiwan. There were two stages for the SARS epidemic: stage I occurred from late-February to mid-April (9th – 16th week), with scattered sporadic cases, and stage II occurred between mid-April and mid-June (17th – 24th week), with severe nosocomial infections in several hospitals. The dramatic decline of scarlet fever notifications in 2003 occurred during the stage II period of the SARS epidemic. For each year between 2000 and 2006, 115 to 273 isolates were collected for genotyping in central Taiwan (Table 1). A total of 1,218 isolates were characterized to investigate the distribution of emm types. In total, 23 emm types were identified in the isolates. The five most prevalent emm types, accounting for 96.8% of the collection, were emm 12 (50.4%), emm 4 (23.2%), emm 1 (16.4%), emm 6 (3.8%) and emm 22 (3.0%) (Table 2). emm 12 was the predominant type found between 2000–2001, accounting for 87.1% and 57.1% of the total isolates in 2000 and 2001, respectively. It became the predominant type again in 2005 and 2006, accounting for 69.3% of the isolates in 2006. emm 1 was predominant in 2002, emm 4 was most prevalent in 2003 and 2004, and emm 6 emerged in 2001 but was not detected again after 2003. The 1,218 S. pyogenes isolates were analyzed by PFGE with Sma I to investigate the clonal relationship among the isolates. There were 127 isolates with DNA resistant to Sma I digestion, and their pattern (with only one DNA band) was referred to as a SPYS16.0026 PFGE-Sma I type. The 127 isolates with the SPYS16.0026 genotype were further analyzed by digestion with SgrA I. The genetic relatedness of the bacterial strains was evaluated by the levels of similarity among the PFGE-Sma I patterns. A dendrogram was constructed using the Unweighted Pair Group Method with Arithmatic mean (UPGMA) algorithm. The dendrogram revealed that all of the emm 4 and emm 6 isolates, as well as the majority of emm 1 and emm 22 isolates, were each distributed in a unique cluster. However, the emm 12 isolates were located in two distinct clusters and two singletons (Figure 2). One of these clusters included 125 emm 12 isolates that were resistant to Sma I digestion. Clustering analysis indicated that isolates with a common emm type were, in general, more closely related than those with different emm types. However, there were a few exceptions. Two strains with different emm types (emm 101 and st 5282) had indistinguishable PFGE-Sma I patterns, and a strain with a st IL103 type was located within the emm 1 cluster (Figure 2). st IL103 is an allele of emm 1 that lacks the codons encoding the mature M1 7–24 residues (http://www.cdc.gov/ncidod/biotech/strep/strepindex.htm; accessed on April 20th, 2009). Sequence analysis suggests that the st 5282 strain could be derived from an emm 101 strain via emm gene recombination, as the sequence for the first 26 codons of the st 5282 gene were identical to that for the emm 101 gene. Two emm 12 and one emm 22 isolates were distant from the major emm 12 and emm 22 clusters (Figure 2). The 127 Sma I-resistant isolates were identified to be of emm 12, emm 1 or emm 58 type. 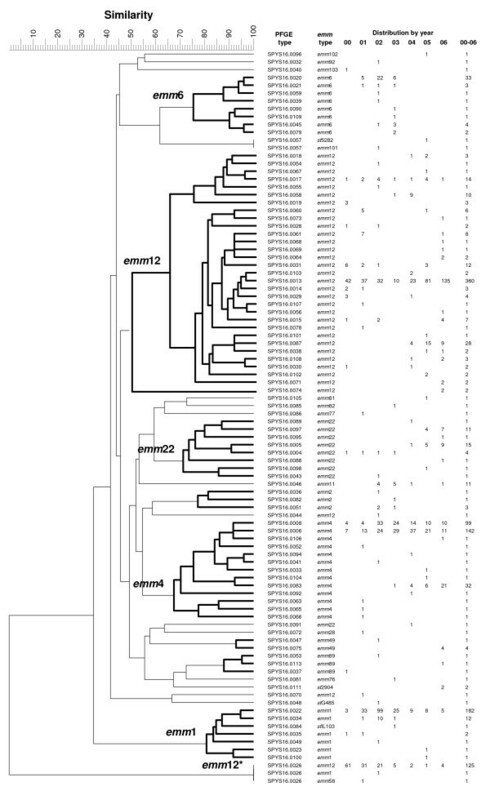 Dendrogram constructed with PFGE- Sma I patterns, with their corresponding emm types and number of isolates obtained between 2000 and 2006. The clustering analysis was performed with BioNumerics using the UPGMA algorithm and the value of Dice predicted similarity of two patterns at settings of 1% optimization and 0.7% position tolerance. In total, 94 emm:PFGE-Sma I genotypes were identified in the 1,218 isolates. Eight major emm:PFGE genotypes, emm 1:SPYS16.0022 (14.9%), emm 4:SPYS16.0006 (11.7%), emm 4:SPYS16.0008 (8.1%), emm 4:SPYS16.0083 (2.6%), emm 6:SPYS16.0020 (2.7%), emm 12:SPYS16.0013 (29.6%), emm 12:SPYS16.0026 (10.3%) and emm 12:SPYS16.0087 (2.3%), made up 82.2% of the 1,218 isolates. Five of the major emm:PFGE genotypes were detected throughout the seven years studied. In contrast, most emm:PFGE genotypes lasted for only 1–2 years; they emerged in the population and quickly disappeared. The 127 Sma I-resistant isolates were discriminated by PFGE with SgrA I into 14 emm 12:PFGE-SgrA I, 1 emm 1:PFGE and 1 emm 58:PFGE types. The 125 emm 12 isolates were distributed in two distinct clusters, A and B (Figure 3). Strains within cluster A were quite divergent, with the most divergent types sharing only 65% pattern similarity. Dendrogram constructed with PFGE- SgrA I patterns, with their corresponding emm types and number of isolates. DNA from these isolates was resistant to Sma I digestion. The clustering analysis was performed with BioNumerics using the UPGMA algorithm and the value of Dice predicted similarity of two patterns at settings of 1% optimization and 0.7% position tolerance. 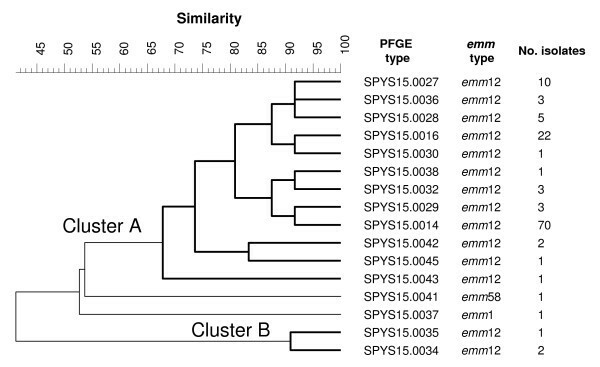 In this study, a cluster of strains (as defined by PFGE types) having a common emm type and sharing higher PFGE pattern similarity than others with different emm types were considered to belong to a common emm clone. The st IL103 strain is an exception to this, as it shared high PFGE pattern similarity with the cluster of emm 1 strains and was therefore considered to be part of the emm 1 clone. Based on the groupings made by the PFGE patterns, six major emm (emm 1, emm 4, emm 6, emm 12, emm 12* and emm 22) clones were identified and are shown in Figure 2. The emm 12* clone represents the emm 12 strains with DNA resistant to Sma I digestion. The six major emm clones made up 96.5% of the 1,218 isolates. The adjusted number of the annual confirmed cases of scarlet fever in central Taiwan ranged from 142 to 282 between 2000 and 2006 (Table 1), and 115 to 273 isolates were collected each year for genotyping. The number of isolates genotyped was adjusted to the number of annual confirmed cases to investigate the association of the fluctuation of scarlet fever cases and the relative prevalence of the emm clones. As shown in Figure 4, the emm 12* and emm 12 clones were the most prevalent in 2000. The two clones declined over time and were at their lowest levels in 2003. The emm 1 clone was the most prevalent in 2002 and the emm 4 clone was predominant in 2003 and 2004. In 2001, although the number of emm 12* and emm 12 clones declined, the number of emm 1 clones increased significantly. The total number of scarlet fever cases in 2002 was doubled that in 2000 and were primarily attributed to an increase in the number of the emm 1, emm 4 and emm 6 clones. The number of cases in 2003 was considerably lower than that in 2002, likely due to a decline in all major clones except for emm 4. The number of cases increased significantly again in 2005, and this increase is associated with a dramatic rise in the prevalence of the emm 12 clone. Distribution of emm clones between 2000 and 2006. The number of Streptococcus pyogenes isolates analyzed is adjusted according to the number of adjusted annual confirmed of cases. The cases of scarlet fever in central Taiwan from 2000 to 2006 were caused by S. pyogenes strains with a limited number of emm types (Table 2). In fact, five prevalent emm types represented 96.8% of the isolates causing scarlet fever during this time period. Of the 23 emm types isolated, 17 made up 99.4% of the isolates. These 17 types were among the 30 most common emm types that caused invasive streptococcal infections in the United States between 2000 and 2004. Twelve of these types accounted for 75.5% of the isolates characterized and were included in the proposed 26-valent vaccine (emm types 1, 1.2, 2, 3, 5, 6, 11, 12, 14, 18, 19, 22, 24, 28, 29, 33, 43, 59, 75, 76, 77, 89, 92, 94, 101, and 114) . In our previous work on 179 S. pyogenes isolates collected in central Taiwan between 1996 and 1999, the five most common emm types in central Taiwan remained the same, but the frequency changed in the two time periods, 1996–1999 and 2000–2006 . However, the prevalence and distribution of emm types could have geographic variation. Yan et al. analyzed 77 S. pyogenes isolates collected from scarlet fever patients between 1993 and 2002 in southern Taiwan and found only three emm types among the isolates, with emm 1 being the most prevalent type. 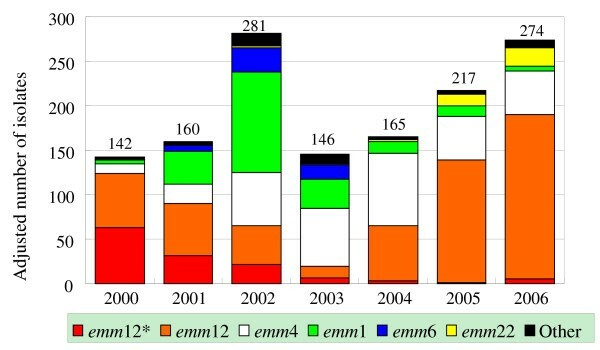 Chen and colleagues characterized 830 isolates collected between 2001 and 2002 in northern Taiwan and found that the most frequent emm types were emm 1 (29.2%), emm 4 (24.1%), emm 12 (19.0%), emm 6 (15.8%), st IL103 (5.7%) and emm 22 (1.9%) . In our study, the most common emm types in 427 isolates collected in the same time period in central Taiwan were emm 12 (35.6%), emm 1 (34.2%), emm 4 (18.5%), emm 6 (7.5%) and emm 11 (0.9%). st IL103 was present in northern Taiwan, but it was not found in the central region during the same time period. Thus, the distribution and frequency of emm types appear to be geographically varied even in such a small country. The geographic variation in the prevalence of emm clones may explain why the epidemiological trend of scarlet fever in 2006 in central Taiwan was different from that in the whole country. The major emm types were further discriminated into a number of PFGE types, and clustering analysis of the PFGE patterns suggests that the emm 1, emm 6 and emm 4 strains belong to a single clone. The emm 12 strains belong to two major clones and two singletons, and emm 22 strains belong to one major clone and one singleton (Figure 2). Thus, six emm clones caused most (96.5%) of the scarlet fever cases in central Taiwan during the seven year time period. The fluctuation of scarlet fever cases was associated with the shuffling of the prevalent emm clones (Figure 4). The finding that only a few prevalent M (emm) types caused most occurrences of scarlet fever in a specific location in a given year period, as well as the shuffling of predominant M types, has been observed in many epidemiological studies in the early 20th century . During major epidemics of streptococcal infections in previous years, only a few serotypes predominated, and the strains were rich in M protein, encapsulated and were highly virulent . Type-specific immunity was important for preventing re-infection with the same M type. It is thought that the shuffling of predominant M types is due to the type-specific immunity, leading to the decline of infections with certain M types and the emergence of other virulent M types. In the present study, the prevalence of the emm 12*, emm 1 and emm 6 clones both increased and decreased within one year. In contrast, the emm 12 and emm 4 clones persisted throughout the seven year period. This phenomenon may be due to the fact that the emm 12 and emm 4 clones produced less M protein and were less virulent than the emm 12*, emm 1 and emm 6 clones. The PFGE study also indicates that each of the six emm clones has one predominant PFGE type, except for the emm 4 clone, which has two major PFGE types (Figure 2). The less prevalent PFGE genotypes of each emm clone emerged and quickly disappeared. Even some major PFGE genotypes, such as SPYS16.0026 of the emm 12* clone, SPYS16.0020 of the emm 6 clone and SPYS16.0022 of the emm 1 clone, remained prevalent for only 2–3 years before declining. However, the SPYS16.0013 genotype of the emm 12 clone did not follow this trend, as it was prevalent throughout 2000–2006 and was most prevalent in 2006. If a newly emerging strain can only prosper in a specific location for a few years, then the emm 12:SPYS16.0013 strains isolated during two different time periods should be different. These differences may not be detectable by PFGE analysis. Whether bacterial isolates that prevail for two periods become genetically diversified is an interesting subject and may be studied by other genotyping methods, such as single nucleotide polymorphism, by virulence gene detection and by antimicrobial susceptibility testing. The SPYS16.0026 isolates, with DNA resistant to Sma I digestion, were found in three emm types, suggesting that they have multiple evolutionary origins. Of the 127 SPYS16.0026 isolates, 125 belonged to the emm 12 type. The first isolate resistant to Sma I digestion was identified in central Taiwan in 1998 and was an emm 33 type. The emm 12:SPYS16.0026 strain was detected for the first time in 1999 . Our previous studies indicated that the emm 12:SPYS16.0026 strain is most likely derived from an emm 12:SPYS16.0013 strain by an insertion of a large DNA fragment into the genome . The large DNA segment could have carried the gene(s) responsible for DNA methylation and resistance to cleavage by Sma I. These strains were analyzed with SgrA I. Clustering analysis of the PFGE-SgrA I patterns revealed diverse genetic relationships among the emm 12:SPYS16.0026 strains (Figure 3). The high genetic divergence suggests that the emm 12:SPYS16.0026 strains have derived from multiple origins. Recently, Euler et al. have shown that resistance to Sma I cleavage is due to the presence of a DNA methyltransferase gene, which is carried on a mobile chimeric element that has transposon- and bacteriophage-like characteristics. This mobile element may explain the high genetic diversity among the Sma I-resistant strains that emerged in such short period of time. The fluctuation of scarlet fever cases between 2000 and 2006 may be partially explained by the shuffling of several prevalent emm clones. However, the dramatic drop in reported cases in 2003 is difficult to explain. In early 2003, Taiwan was badly hit by a severe SARS outbreak. The SARS epidemic in Taiwan had two distinct stages, with the beginning in the late-February (the 9th week) and the second ending in mid-June . The stage I epidemic occurred from late-February to mid-April (the 9th to 16th week) and consisted of only scattered, sporadic cases, with most of the patients having recently traveled to China. In this stage, the disease did not cause much panic and the level of scarlet fever remained high. In stage II (from mid-April to mid-June or the 17th to 24th week), several clusters of infection occurred via intra-hospital or inter-hospital transmission. Enormous panic spread over the whole country after an outbreak of nosocomial infection was confirmed on the 22nd of April. The disease was subsequently transmitted to several hospitals and spread from the North to the South. The number of scarlet fever cases dropped remarkably during this period. Because a large portion of the SARS infections was associated with hospitals, fear of SARS drove people out of hospitals and public places. This fear and the change of people's behavior may have significantly reduced the number of outpatients and the transmission of many infectious diseases, including scarlet fever. In fact, the SARS outbreak had a long-term effect on the occurrences of scarlet fever. After the SARS epidemic, the number of weekly scarlet fever reports was often lower than the overall average until the first half of 2004. The occurrences of scarlet fever in central Taiwan between 2000 and 2006 were primarily caused by six emm clones: emm 12 (40.0%), emm 4 (23.2%), emm 1 (16.3%), Sma I-resistant emm 12* (10.3%), emm 6 (3.8%) and emm 22 (2.9%). Each emm clone had predominant PFGE genotype(s), and most minor genotypes within an emm clone emerged and quickly disappeared. The large fluctuation in the number of scarlet fever cases during this time period can be attributed to the shuffling of several prevalent emm clones and to a SARS outbreak in 2003. Scarlet fever was a notifiable disease in Taiwan until 2007; hospitals and clinics were obligated to report confirmed or suspected cases to the county public health department via a web-based Notifiable Diseases Reporting System established by the Taiwan CDC in 2000. The hospitals and clinics that reported scarlet fever cases were asked to provide throat swab specimens or S. pyogenes isolates to the regional laboratories of the Taiwan CDC for bacterial examination and genotyping. Confirmed cases were those in which S. pyogenes was isolated from the specimens. The number of annual confirmed cases detected through the Notifiable Diseases Reporting System was adjusted by multiplying the number of reported cases and the rate of positive specimens. S. pyogenes isolates used for characterization in this study were obtained directly from hospitals located in central Taiwan through the Notifiable Diseases Reporting System or were recovered from throat swab specimens collected from hospitals and clinics through the Notifiable Diseases Reporting System and the Sentinel Physician Active Reporting System. The procedure developed by Beall and colleagues  was used to prepare the emm DNA fragments from S. pyogenes isolates for sequencing. The amplified DNA amplicons and primer 1, 5'-TATT(C/G)GCTTAGAAAATTAA-3', were sent to a local biotech company (Mission Biotech Corp. Taipei, Taiwan) for DNA sequencing. The 5' emm sequences (at least the first 240 bases) were subjected to a BLAST comparison with those in the emm database (http://www.cdc.gov/ncidod/biotech/strep/strepindex.htm; accessed on April 20th, 2009) to determine emm type. S. pyogenes isolates were subjected to PFGE analysis using a previously described protocol . All of the isolates were analyzed by Sma I digestion. Isolates with DNA resistant to Sma I digestion were analyzed with SgrA I. PFGE patterns were recorded using a Kodak digital camera system (Kodak Electrophoresis Documentation and Analysis System 290; Kodak; Rochester, NY, USA) with 1792 × 1200 pixels. The digital PFGE images were then analyzed using BioNumerics software version 4.5 (Applied Maths, Kortrijik, Belgium) and the DNA pattern for each isolate was compared using the computer software. A unique PFGE pattern (genotype) was defined if it contained one or more DNA bands different from the others. The genetic relatedness among isolates is presented in a dendrogram built by clustering the PFGE patterns. The clustering analysis was performed using the UPGMA algorithm provided in the BioNumerics software and the value of Dice predicted similarity of two patterns at settings of 1% optimization and 0.7% position tolerance. This work was supported by grants DOH94-DC-2025 and DOH94-DC-2026 from the Centers for Disease Control, DOH, Taiwan. CS Chiou initiated and managed the project, analyzed data and wrote the manuscript. YW Wang worked on emm sequencing, PFGE analysis and data analysis. PL Chen collected and analyzed epidemiological data from the Notifiable Diseases Reporting System. WL Wang worked on PFGE analysis. PF Wu coordinated the laboratory and disease surveillance sectors in Taiwan CDC. HL Wei helped with identification of emm types. All authors have read and approved the final manuscript.